This 19th century Dutch post-Impressionist painter was able to perceive the hues in the stars, even the brilliance of forget-me-not blue. I can’t see those colors in the night sky, yet I like greeting them hovering overhead when I come home at night and walk from my garage to my house. I missed the stars Tuesday night when I arrived home in the rain after my first Compassionate Friends meeting. I finally had the energy and interest to try out this group of people who meet to work through the grief of losing a child. Display posters held beloved photographs of lost children, from infants to middle-aged adults. How fortunate we are today to have the ability to look at color images of our children. Only a century ago I would not have had photos showing my son Tristan’s eye color–camouflage green–even if I would have been lucky enough to have a single picture of him. There is a legend encapsulating the value of remembering someone’s gaze through eye color. In this story, the Christ Child is sitting on Mother Mary’s lap. He wants others to experience her heavenly gaze, so he touches her eyes, then waves his hand over the ground. 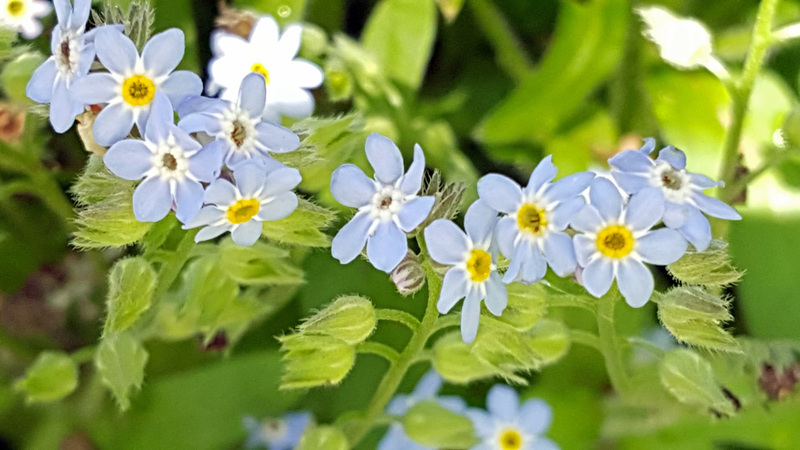 Blue forget-me-nots appear. Blue forget-me-nots have sprung up in my garden this spring, right next to Tristan’s developing garden. Through these flowers Mary gazes upon me and upon Tristan’s garden. And Tristan himself has witnessed her loving gaze on the other side. Now he is in her care. She is the best of mothers. A child is never forgotten. The grief might shift and there might eventually be acceptance, but we all will always remember our children. Perhaps some forget-me-nots would be a nice addition to a garden in memory of how cherished they are to us. Did you ever wish your weeds would just disappear? Even the Hebrew Bible describes the Divine as one who would step on and completely burn up weeds. I get even better revenge on my weeds. I eat the ones I recognize. 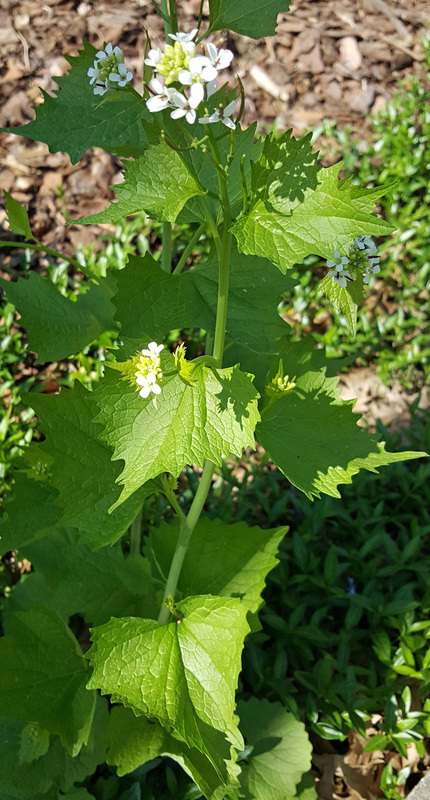 Some weeds provide wild, natural, bitterly nutritious greens that can be added to salads or smoothies. I prefer smoothies so I can gulp them down rather than taste the bitterness. During this past weekend I went on an edible weed walk at Turner Farm in Indian Hill, Ohio. Nancy Ogg from Shady Grove Farm in Kentucky provided expert guidance for what common weeds could be eaten. Please do not pick weeds without knowing exactly what they are and what parts are safe to consume. I asked if dandelion flower stems were edible. Nancy said yes, though they are quite bitter, probably because they are the most nutritious part of the plant. Smoothie filler for me. Apparently violet blossoms are safe, because they can be added to salads for color. At the end of the class each of us took home a small jar of violet jelly. Delicious! We found three black mustard plants growing in the compost heap. I brought them home because I love stir-fried black mustard seeds with fresh radishes, a great anti-inflammatory meal for cancer thrivers. I planted the foot-tall weeds in my compost bed. Because weeds resist cultivation, my friend Kathleen suggested I threaten the plants periodically by waving and whirring a weed wacker over them so they’ll think they are wild and free. In the meantime, I forage on my property, adding a little variety beyond dandelions with hairy bittercress and garlic mustard. No recognized weed will be left behind. Have you ever wanted just one more hug from your loved one who has crossed over? Nothing is so heavenly as the embrace of your own angel’s love, the angel of a loved one who has passed away and visits during dreamtime. It’s been about ten months since my teenaged son passed away. I’d been complaining to him a bit lately. Why hadn’t he come to me during my dreamtime? He knew I tracked as many dreams as I could. Yesterday he finally showed up. I felt so comfortable with him in the dreamtime that I didn’t realize for a while that he’d finally actually showed up. So I asked him for a hug. He felt so substantial, so real, as I held him for a few moments. Then he evaporated and I woke up. What a wonderful gift, to receive a hug from my son from the Other Side. 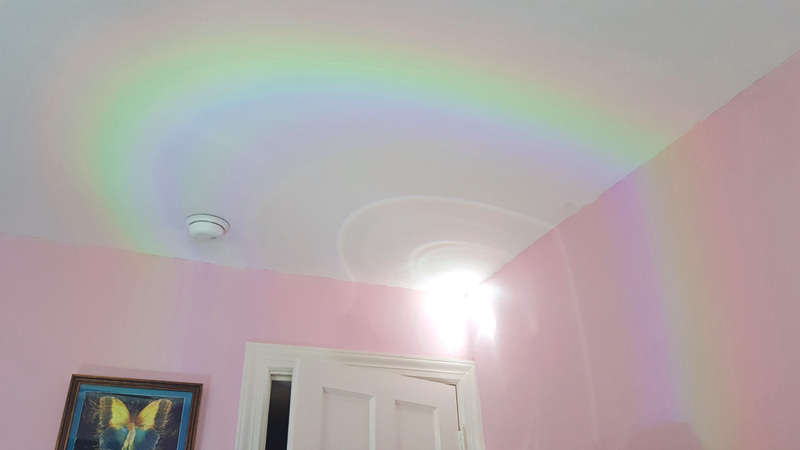 That afternoon, after I finished meditating, I looked up to see a gorgeous rainbow on my ceiling. A rainbow just as I’d pictured in my children’s book, Emily’s Dreamtime. Yes, Tristan had paid a visit, had hugged me. The circle is complete. If you have lost a loved one, ask the person to come to you during your dreamtime, and to help you remember it when you wake up. What practical things have you done to help another through grief? 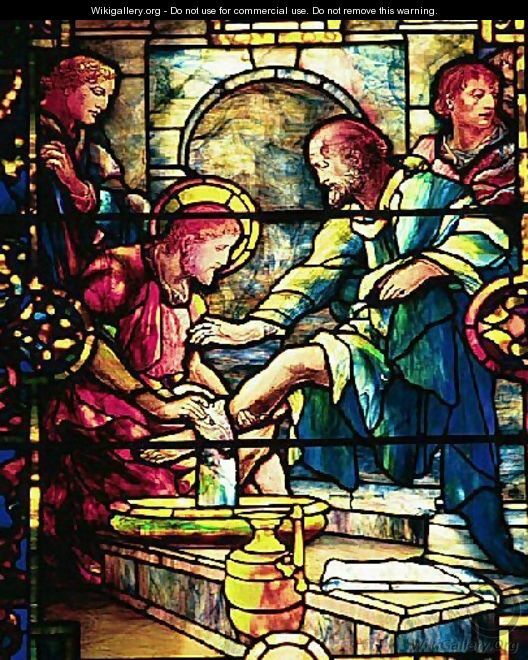 When Jesus gathered his followers for their last supper together, he started the evening by washing dirt off their stinky feet—taking on the role of a slave. Jesus was calling his disciples to be servants of one another. Little did they know they would soon be grieving Jesus’ crucifixion, yet Jesus had demonstrated for them how to deal with their anguish: serve one another. Following Jesus’ example doesn’t have to involve washing feet. It can be washing your own hands after digging them in the dirt of a friend’s garden. My friend Rebecca, a minister and chaplain, not only preaches well—she performed the ministerial role at my son Tristan’s funeral—she surprised me last fall by offering to come over to plant crocus bulbs in his garden and help me with other chores I couldn’t do alone. Rebecca works long hours in an emotionally demanding job and uses weekends to rest up so she can go back out and continue assisting people with major life events. Yet she cleared a full day so she could come over and help me out. We planted dozens of crocus bulbs and did a variety of other jobs that would have been much more difficult to do alone. I am honored by her generosity of spirit and gracious assistance. It was healing balm for my heart, as if she was picking up some of the slack that Tristan left behind. She symbolically did what Christ encouraged all of us to do—to wash up after others. She is living what she preaches. Sometimes the best help for a grieving person is coming over and doing the chores the loved one usually did. This demonstrates that even though there is a terrible loss, others can pick up a little bit of the slack and make life a tiny bit more bearable.